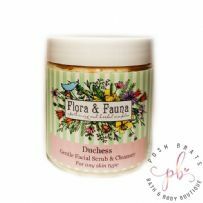 A great moisturizing lathering facial exfoliating cleanser with a blend of nourishing essential oils and herbal extracts. Repairs and nourishes skin, balancing oil production. This softens, protects and restores suppleness to delicate and sensitive facial skin. The scrubbiness in this blend comes from a combination of Scottish Oats, Dried Lavender Buds, Jojoba Beads, Ground Loofah, Rosehip Powder and Poppy Seeds along with Organic Beet Sugar. Treat your skin to a luxurious experience by using this lathering facial exfoliating cleanser; It gently cleanses leaving skin fresh and radiant. With nourishing oils of Rosehip,Crambe Seed, Black Currant Seed Oil, Vitamin E and Grape Seed oil to gently cleanse without drying. Gentle enough for daily use and it will easily remove make-up without stripping your skin of moisture. Geisha Pearl Cream is made from well selected pure precious pearls which are reduced into very fine powder (about 2 microns in diameter). Pearls are an excellent source of minerals, amino acids and calcium carbonate, the most absorbable form of calcium. Using cutting edge biotechnology, pearls are granulated into micro molecular particles to easily and efficiently melt into skin. Now, bring the flawless, glowing luminosity of this exquisite jewel to your skin. Also enriched with cutting edge skin care natural compounds such as Green Tea Extract, Siberian Ginseng, and Wild Yam Extract. The scent is a lovely natural blend of Roses & Indian Jasmine Oils which not only smells wonderful but is fabulous for your skin. Dragon Balm is an ancient Chinese formulation that has been used successively for many years, it helps to calm and relax whilst helping to soothe the mind and body in a quick and simple application. Instant relief from painful muscles and inflammed joints.